This plugin is free for use, but please notify us if you found a bug or if you have some suggestion. The author of this plugin is not responsible for any damage or data loss! It is not allowed to sell this plugin for money, it has to be free to get! It is also not allowed to use our source code and publish that with your name! Please ask us for a permission first if you want to publish something which contains parts of our source code! With this Teamspeak 3 Client plugin you have short chat commands to move all clients from a channel or the whole virtual server to a specified channel. In addition to that, some commands also have a context menu entry, so you can just click with your mouse. On Windows just copy the right DLL file into the C:\Program Files\Teamspeak 3\config\plugins directory. This plugin contains two DLL files, one for 32 bit and one for 64 bit. Use the right one for your Teamspeak 3 Client installation. If you use the 64 bit Teamspeak 3 Client, use the 64 bit plugin. For the 32 bit Teamspeak 3 Client use the 32 bit plugin. 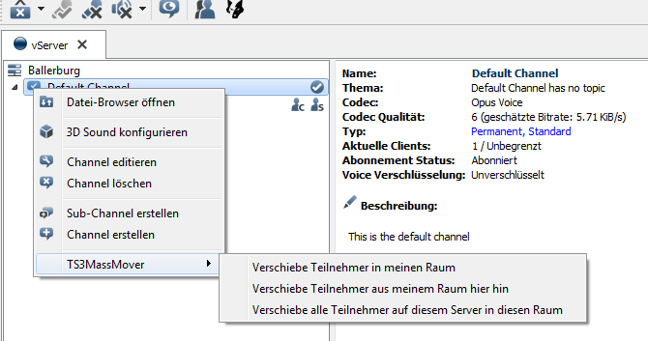 After you put the right DLL or SO file into the plugins directory, just activate the plugin in the Teamspeak 3 Client. To do this, just click on Settings -> Plugins, click on "Reload All" and activate the check box next to the TS3MassMover. To localize messages copy the selected language from lang folder into the C:\Program Files\TeamSpeak 3\config\plugins directory and rename it to TS3MassMover.lang: copy C:\Users\Dev\Downloads\TS3MassMover-v0.60.21\lang\TS3MassMover.de "C:\Program Files\Teamspeak 3\config\plugins\TS3MassMover.lang" If TS3MassMover.lang is missing the plugin will create the english version, so you could also translate it by your own. For common commands just right click a channel and open the sub context menu entry TS3MassMover. On that way you can easily move all clients from or to the selected channel without using chat command, which is similar to the /m h and /m t chat command. You can also move all clients on the TS3 server to that selected channel, which is the same like /m at command. One command you will find at the TS3 main menu Plugins -> TS3MassMover and acts like the /m ah command. Like in the second example, you can write the channel password as last argument on all commands. Moves all clients of one channel to another channel! Please do not send Emails to me or Stefan Martens! Use the forum thread for support/feedback. Added command fctc to moves all clients of one channel to another channel! Added commands sgt and sgh to move all members of a server group. Small changes releated to TS3 client beta 28.